The two videos I missed for the TEDx Tampa Bay event last month, themed The Future of Stories illustrate where stories, or technology’s ability to share stories, may be heading. The first was The Gods Must Be Crazy, (trailer) a 1980 South African comedy that tells a wild story of a Bushman’s encounters with modern man, our technology and our society. The second, a 2009 documentary We Live in Public, (trailer) profiles Josh Harris, an Internet pioneer obsessed with how technology would lead to our loss of privacy. Harris made millions in the 1990s from Internet projects and led a rather eccentric lifestyle that was seemingly driven by a deep disconnect from his mother combined with a young obsession with television. A key segment of the film is a project called “Quiet: We Live in Public”. The experiment was based on Harris’ 1999 prediction that in the near future people would be placing more and more of their lives on the Internet for everyone to see, share, and comment on. While Harris was very correct in cold facts, he did not understand what would really drive people to connect in such an open way on social platforms today. Similar to Facebook, all Harris’ participants volunteered to be there and had to agree to the terms of the provider. Unlike Facebook, which often will revise new updates that users protest as intrusive, Harris would not soften the edges of his experiment to find a comfortable threshold for his subjects. Harris gained a sociopathic like energy from the control he had, whereas Facebook reacts to unrest (artificially or authentically) in a seemingly empathetic manner towards the Facebook community. Harris readily supplied angst while Facebook strives to build trust. Bringing this back to TEDx Tampa Bay’s theme, is how the documentary ends with Harris living in southern Ethiopia where he is experiencing a simple life of interaction among the Ethiopian population. I had just an hour earlier finished watching The Gods Must Be Crazy and the very cyclical nature of the future of stories became clear. TEDx Tampa Bay presenter Michael Kruse ended his talk stating that “the future of stories is stories” which Abby Album summarizes well. In trying to predict where technology is taking us, we have developed some good theories but are missing something significant. We are evaluating the loss of privacy and living in public through the lens of our current modern society. 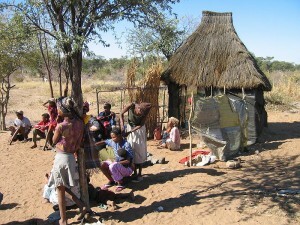 The Bushmen of Africa truly live in public. They live in a similar manner as our ancestors where trust and empathy were key to allowing those cultures to survive. Technology is allowing us to build larger interconnected relationships, that while making our lives more public are allowing us to understand others more readily. As a species we historically have lived in public longer then we have lived in modern society. It is not a stretch that our desire to share our lives is driven by an authentic human need to connect with everyone in our tribe or village. The challenge is that Internet and social media has made sharing so scalable that we have become obsessed with it, the entire world has become our village. Many predict that this obsession will lead to burnout in similar manner as Harris’ experiment. The Internet in terms of human development is similar to a 20-year-old and obsessed with socializing. Humanity is not going to burn out from being connected. Humanity will mature from being connected. The RSAnimate video below on our human empathetic characteristics illustrates how we are soft-wired for empathy and how as a civilization we extended our empathy to larger and larger groups as technology increasingly annihilated exponentially more time and space between increasingly larger groups.